The Field Notes Snowblind 3-Pack notebook is the COLORS winter edition for 2015. Designed with a 100# cover stock Sappi McCoy Silk cover that is silk screened, a COLORS first. The notebook is bound with glossy white staples on the edge. The Field Notes logo is printed in custom pearlescent “Interference” ink that glitters and sparkles like the snow. The rest of the book is coated in a nearly-magical “Photochromic” ink that changes color when exposed to direct sunlight. Indoors they are white, outdoors they are blue! The 48 interior of each Field Notes Snowblind notebook has 60# Finch Opaque text paper with a very faint grey graph. Note:The Field Notes Winter COLORS Snowblind is a new item and will be shipping the week of Nov. 23rd. 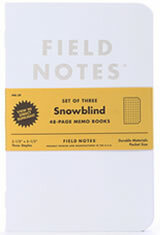 The Field Notes Snowblind 3-Pack Memo & Notebooks usually ships within 1 business day unless otherwise specified. Each Field Notes Snowblind 3-Pack Memo & Notebooks we sell is guaranteed to be genuine, authentic and will arrive brand new & unused!